Jaimie Senger has been a patient at Children’s Hospitals and Clinics of Minnesota for a little over three years… but she’s been a Minnesota Vikings fan her whole life. One of Senger’s favorite players to watch is linebacker Chad Greenway—but she loves him for a lot more than his on-field performance. 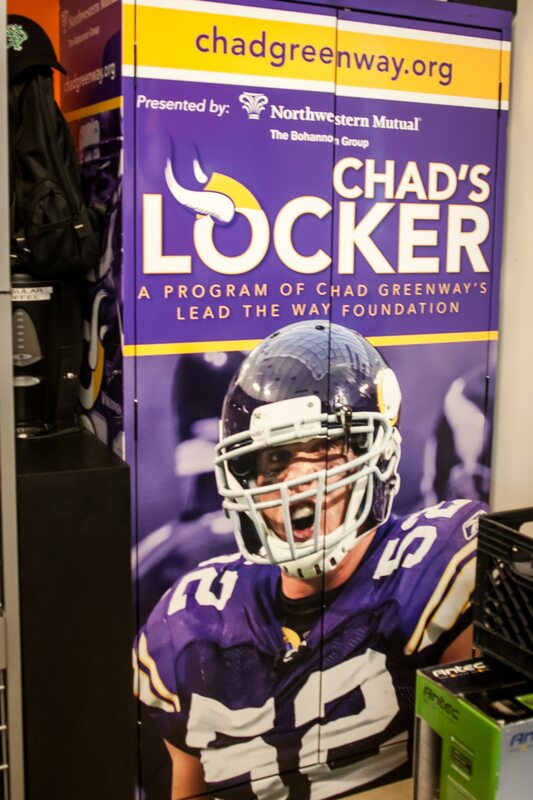 Senger is just one patient that benefits on a daily basis from Greenway’s Lead the Way Foundation and more specifically, the Chad’s Locker program. The idea for the lockers generated after a few visits Greenway made to hospitals earlier in his career. The linebacker said he often saw kids confined to hospital rooms without much to do, and he felt it was a gap that his foundation could fill. Each locker is stocked with an inventory of electronics available for check-out by patients or family members; the contents include everything from iPads and laptops to video games and video game systems. Prior to the lockers being installed, individuals were welcome to bring their own electronics, but the hospitals did not have the means to lend out items. Agent Elliot Nelson and Development Officer Barbie Hentges work closely with the Chad’s Locker program at Children’s. In March 2012, Chad’s first locker was installed at the University of Minnesota Amplatz Children’s Hospital. 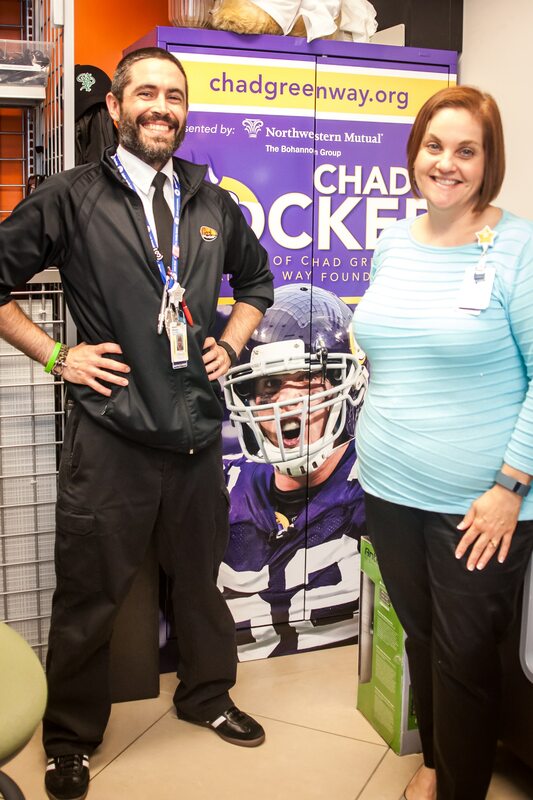 In October, Greenway launched his second locker at Children’s Minneapolis Hospital located in the Geek Squad Precinct. At Children’s, Geek Squad employees (known as “agents”) manage the locker’s inventory and interact with hospital visitors daily to ensure any and all technology needs are met. The agents track use of the devices as well as requests or needs for new materials. Technology is constantly evolving, and Greenway’s foundation makes it a priority to keep the lockers stocked with current equipment. Agent Elliot Nelson began working at Children’s one year before Greenway installed the locker, and he says it’s made an astronomical impact. Because Greenway’s foundation supplies such up-to-date electronics, Geek Squad agents are able to easily make the iPads and laptops compatible for a variety of things—including Netflix, CaringBride and Skype. They also have the capability of connecting to a patient’s own DVR at home so he or she can watch specific television programs. Children’s Development Officer Barbie Hentges works directly with Lead the Way Foundation representatives and can’t speak any more highly of the program, which is due to make another shipment to the locker soon. Hentges says the Foundation is always very approachable and easy to work with, and she is beyond thankful to Greenway and other players who donate time and resources to the hospital. Hentges connects with the Geek Squad agents to learn specific needs or requests of the patients and then communicates that to the Foundation, which in turn works to provide materials as able. Agent Nelson tells me that some of the more popular devices—iPads especially—are used so often that they are checked out more times than there are days in the year. The locker program helps the hospital in more ways than one; because of Greenway’s generosity to the hospital, Nelson and other staff members are able to reach out to other donors and, in a sense, challenge them to match donations to those of Lead the Way. “[Chad] raised the bar really fast,” Nelson adds. Similar to his on-field reputation, Greenway will keep fighting and working hard and get things done—especially when it comes to the locker program. He hopes to continue offering the latest materials so that patients and families have complete access. For the linebacker, it’s more than worth it to see patients like Senger enjoying the results. In talking with Senger, who turned 18 this week, you would hardly guess from her positivity that she is undergoing treatments at a hospital. She gives fist bumps to the Geek Squad agents, laughing loudly as she tells me about making her dad watch The Bachelorette with her on a recent visit. Interacting with the teenager’s bubbly personality, I somehow feel as if I’ve known her much longer than 10 minutes. Senger has encountered plenty of obstacles, as have many patients at Children’s, but her main focus is thanking those who have done so much to make an impact on her and her family. In this case, she’s incredibly grateful for Greenway and the Chad’s Locker program. As many of you know, Vikings Territory has collaborated with a number of other Vikings sites to raise money for this worthwhile cause. We’re having a friendly competition between sites with the unified goal of raising $10,000 for the Chad’s Locker program. Please consider partnering with us to reach our goal and positive impact these children and their families. To donate to the #MoreThanWords campaign on behalf of your favorite Vikings site, please click here. Lindsey Young (Featured Columnist) is a graduate of University of Northwestern – St. Paul and is an avid Minnesota sports fan[atic]. It’s been argued females don’t know much about sports, but she begs to differ. Her work has been featured on Bleacher Report, KSTP.com, and Fox Sports North. In addition to her work with VT, Lindsey is a contributing writer for Canis Hoopus, runs a bi-monthly fan feature for Timberwolves.com and is a freelance writer for Vikings.com. You can read her blog at Making the Call and follow her on Twitter. This is just amazing! It always makes me smile when I know that “big name” people are willing to help others and use their money for good. Thank you for sharing this, it made my day!